For my second card today, I used the colors from Sunday Stamps - navy, pink and silver. I inked the flower from Love and Care in Versarmark then colored it with Strawberry Slush and Night of Navy markers before clear embossing it onto Whisper White - yes, I have a navy flower stem :) The Strawberry Slush DSP is adhered directly to the Whisper White card base, while the panel with the flower is popped up on dimensionals - which you can't see in the photo. The sentiment was silver-embossed onto a tag I received from my Merry Monday Secret Santa. The twine is from American Crafts and matches Night of Navy close enough. Thanks for looking. I'm not in love with the card, but I spent enough time on it and had to call it quits! Love the simple and clean look to your card. 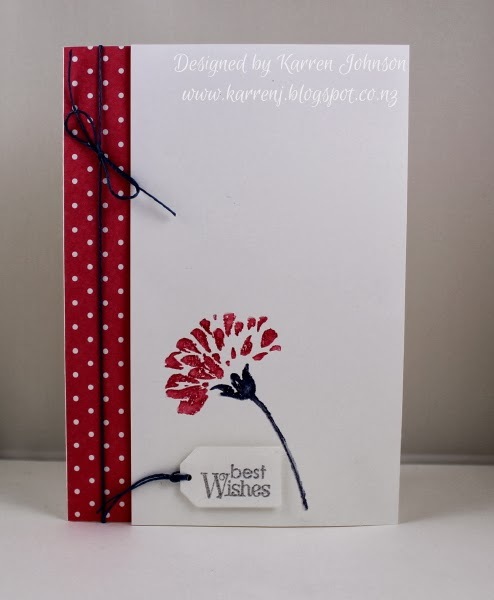 The flower and polka dot paper is cute! Thanks for joining us at Sunday Stamps, hope you will join us again. Very pretty flower! The DSP and twine show it off perfectly. Thanks for joining us at Sunday Stamps! This is so pretty. I love the CAS look you created. Great use of the challenge colors. Thanks for joining us at Sunday Stamps. Very lovely job! That stamped flower image is gorgeous. Thanks so much for sharing with us at Sunday Stamps, we sure hope to see you back again soon!!! Beautiful CAS card! 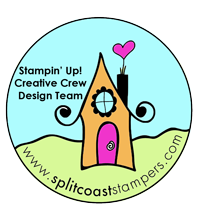 Thanks for explaining how you made it and thanks for joining us at Sunday Stamps this week--please join us again soon! I think this is so pretty, Karren! All the white space really lets that pretty flower shine! Love the sweet simplicity of this! I really like the card! Love the CAS look and the navy stem. 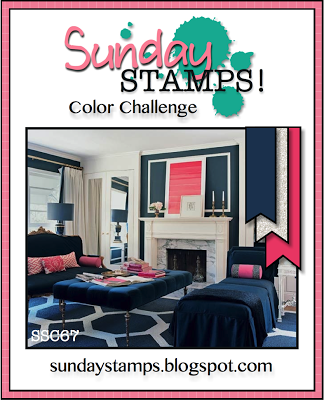 ;) Thanks for playing along with us at Sunday Stamps!